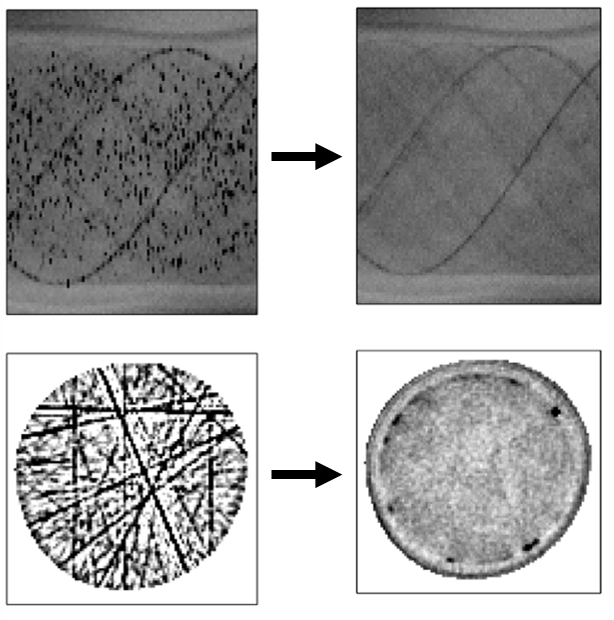 In X-ray diffraction computed tomography (XRD-CT), large crystallites can produce spots on top of the powder diffraction rings, which after data integration and tomographic reconstruction, lead to line/streak artefacts in the tomograms. This is a major issue as the chemical information present in the XRD-CT can be lost. Mn-Na-W/SiO2 catalyst (powder form) in combination with a BCFZ perovskite hollow-fibre ceramic membrane. We developed a new data processing strategy to remove the line or “streak” artefacts generated in reconstructed XRD-CT images due to the presence of large crystallites in the sample. In our simple approach, we take the polar transform of collected 2D diffraction patterns followed by directional median/mean filtering prior to integration, yielding artefact-free images. For example, in this specific materials system, after the filtering process, we were able to observe that the Mn-Na-W/SiO2 catalyst chemically interacts with the BCFZ membrane forming a new stable phase, identified as BaWO4. Such information is crucial for the design of improved catalytic membrane reactors that exhibit long-term stability. The line or “streak” artefacts are very common in XRD-CT data. Finden scientists have the necessary technical tools to remove such artefacts and generate artefact-free images where the chemical information is preserved.